Liked the friendly helpful attitude of all the staff. The rooms were cleaned daily beds made daily and floor washed daily. Our cleaner Tana was brilliant, toilet rolls replaced regularly always with a smile and cheery Calimera. Pool area and area around bar always clean and tidy as was the reception. Would recommend and have recommended this property to anyone who asked for our opinion. Very friendly people nice and clean rooms and very good location. Arrived as guests leave as friends. 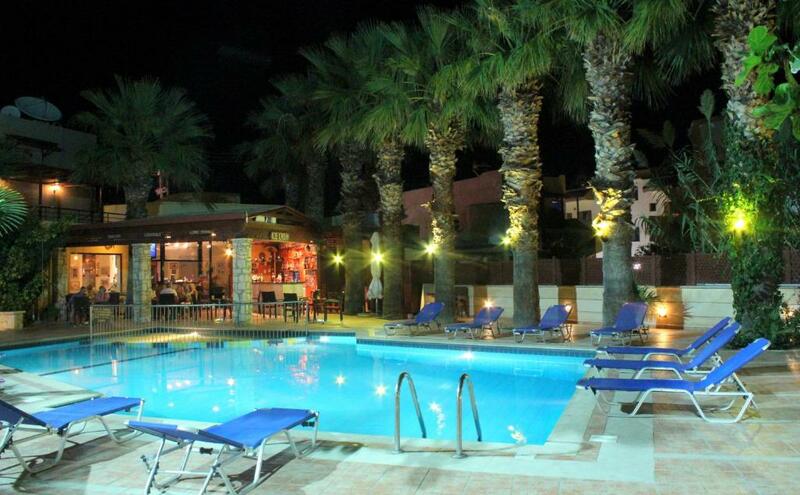 Excellent location good poolside facilities Bar n food excellent value Manos and his staff were friendly and attentive ,so helpful and nothing was too much trouble. Studio room for 3 ,clean ,beds comfortable ,bedding n towels changed every couple of days. Maids cleaned room daily which was excellent not intrusive. Central location only 2 minutes to bars and restaurants and shops.Large supermarket nearby.Friendly bar staff thanks to Manos and Costa and all cleaners who looked after our room every day with sheets and towels changed regularly.The pool area is very clean with plenty of sunbeds and umbrellas and clean pool. The location was ideal, the facilities were excellent, with daily cleaning and laundry facilities changed every other day. The variety of snacks at the pool bar were good, especially the BBQ on Sunday night was exceptional, and the pool is a reasonable size and kept clean, but most all the the staff were very hospitable/friendly/nothing was to much trouble. Even in my hour of need when our flight company ceased trading, during our visit, they were quick to assist in every way. staff friendly, small pool area with sunbeds available. beds were basic but very comfortable. Efficient Air con and (small) safe available (for charge). we were in main building so fairly close to beach but there are some apartments in separate block even closer to beach but further from pool and bar. All staff so very friendly and welcoming. Great bar serving big variety of drinks and delicious food. Fabulous location with bars, restaurants and beach on the doorstep. Lock in a great price for Latania Apartments – rated 8.7 by recent guests! Latania Apartments This rating is a reflection of how the property compares to the industry standard when it comes to price, facilities and services available. It's based on a self-evaluation by the property. Use this rating to help choose your stay! Surrounded by hills, Latania Apartments provide free parking and affordable, large apartments and studios in Stalis, just 100 feet from the 2.5 miles long Stalis Beach. Latania Apartments features a large pool and pool bar that includes a satellite TV, a game room, Arcades area, and an Internet corner for all guests. A variety of taverns, stores, and a medical center is within walking distance of the property. 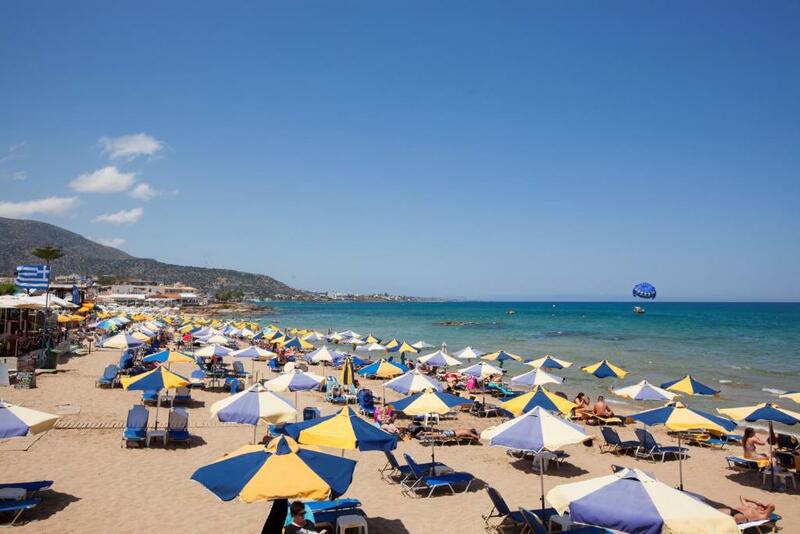 To further explore Crete, there is a bus service 650 feet away that heads to all major cities. 뀐 Located in the top-rated area in Stalís, this property has an excellent location score of 8.9! When would you like to stay at Latania Apartments? Studio contains one double bed and one sofa bed. Air conditioning and safes are available for an extra fee. Studio has a kitchenette, one double bed and 2 sofa beds. Air conditioning and safes are available for an extra fee. Includes one double bed, 1 bathroom, 2 single beds, and a balcony with sea/garden views. Air conditioning and safes are available for an extra fee. This room type cannot accommodate any extra people. Air conditioning and safes are available for an extra fee. 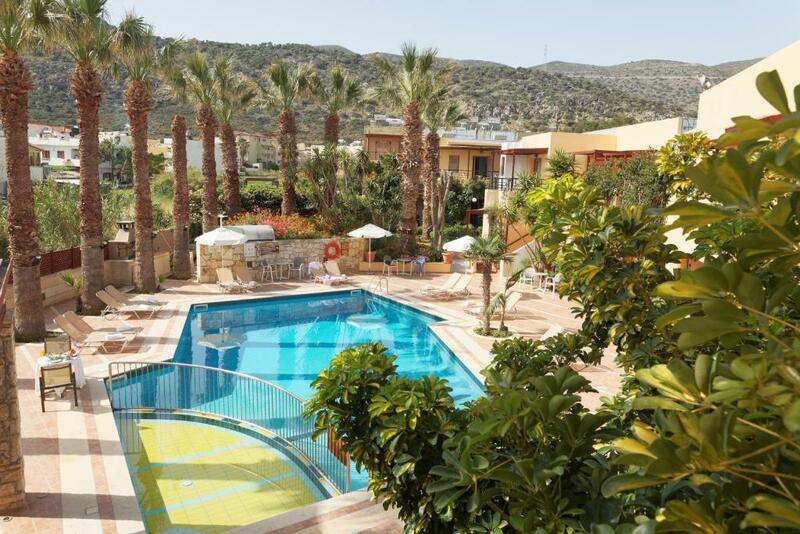 The hotel is situated just 2 minutes walk from a sandy beach, in the center of Stalida resort where the guests will find almost everything they might need. We would like to welcome you to discover Cretan hospitality, local traditions and values. You will have the opportunity to see for yourself that in Crete and especially at Stalida and Latania the traditional Cretan hospitality not only is alive but it is a feature of everyday life. House Rules Latania Apartments takes special requests – add in the next step! Latania Apartments accepts these cards and reserves the right to temporarily hold an amount prior to arrival. Needed a light over the dressing table area for hair drying and make up. A few extra English language programmes on the tv would have been good as would an English language radio station. People reserved the sunbeds problably in the middle of the night, leaving their towels withour using them much during the day. The hotel should stop such behaviour as it is really annoying and unfair to the rest of the guests. Hello all, I wanted to write this review from my most recent holiday. This is my 6th stay at Latania and it has by far surpassed all expectations. I have wrote several reviews about this fantastic hotel but they honestly just keep getting better. The staff are incredible and nothing it too much. A special thanks to Manos, Babis, Costas and all the front of house staff who really make my stay memorable. The rooms were spotless and the beds comfy. I’d even say I slept better in their beds than my own! The maid went above and beyond when cleaning our room taking time to decorate our bed with towel origami. Very nice touch! She even did our washing up which was so kind and unexpected. Thank you thank you thank you! The hotel is self catering but you are not stuck for choice. Surrounding the hotel are brilliant restaurants and a supermarket is located next door. You have the facilities within your room; hob, kettle, microwave, coffee machine, fridge/freezer. They provide pans and utensils which are very useful. A Greek night/all you can eat BBQ is hosted every Sunday at this hotel. Very fairly priced and the food is to die for! 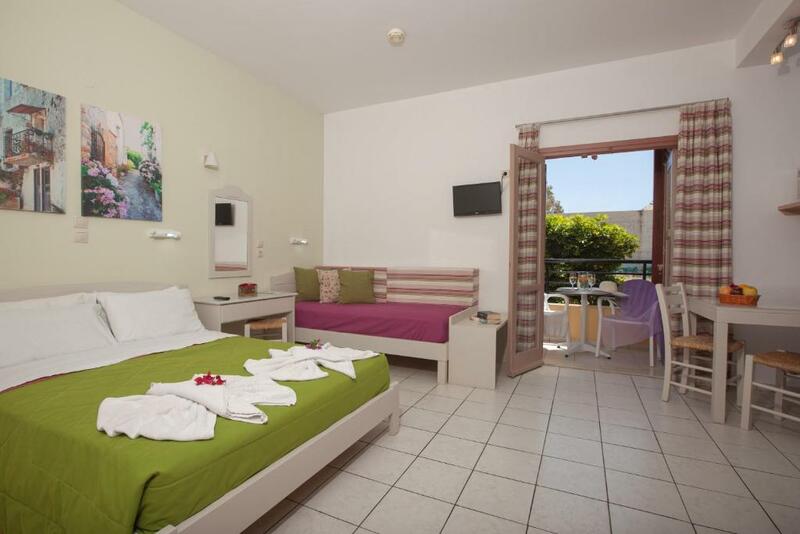 This hotel has a great atmosphere and is suitable for families, couples of all ages and groups of gals and guys who want a holiday together. There is a place for everyone at Latania. All in all, if you’re wanting a hotel with excellent standards in all areas and a good location, I would 100% recommend Latania. I wouldn’t stay anywhere else when I come to Crete. (I have stayed in other hotels but nothing compares.) Hope to see you all very soon. The Queen of Latania. Although a sign said no reserving sunbeds some were there early then left them empty. Bathroom was small. Shower was really small. We really couldn't find any faults! Having to leave really good friends behind who treated, and looked after you so well, and leaving a well organised, and very well run establishment. It's very hard to to leave when you are thoroughly enjoying yourselves. lack of drawers for storage especially as we had been put into 4/5 person apartment. Fridge, toaster and kettle cutlery and utensils provided. Small hob which wouldn't have done for 4 people, but we ate out all the time. TV very small and no where to sit comfortably to watch it. Balcony overlooked road and building site and cleaner left these doors open every day would have been easy for someone to climb in. given overall cost and numerous other hotels / apartments in area we would look elsewhere if we returned to Stalis.